On October 13, 2015, General Chang Wanquan, Chinese state councilor and Minister of National Defense, held talks with Kazakhstan’s Defense Minister Imangali Tasmagambetov in Astana. The China-Kazakhstan bilateral summit resulted in an exchange of defense policy ideas and the promise of expanded inter-military cooperation between the two countries on common security concerns. Chang emphasized that China and Kazakhstan are friendly neighbors and strategic partners, while his Kazakh counterpart underscored their common desire to ensure stability in Central Asia. The conciliatory rhetoric between China and Kazakhstan on defense policy represents a significant upgrade in the partnership between the two countries, which has historically been dominated primarily by economic linkages. It also highlights Kazakhstan’s desire to restrict the scope of its integration with Russia. China’s shift from threat to strategic partner in the eyes of Kazakh policymakers in the two decades since the breakdown of the USSR is a major sea change in perceptions. Despite this progress, China faces a major uphill battle if it is to supplant Russia as the leading influencer of Kazakhstan’s security policy. The legacy of Kazakhstan’s historical integration with Russia and the lack of progress on dealing with separatist threats of major concern to both countries ensure that the partnership is not as deep-rooted as official rhetoric would suggest. In the years immediately following the 1991 collapse of the Soviet Union, Kazakhstan had a circumspect attitude towards China on security issues, as it feared a potential Chinese military intervention across its shared border. Anti-Chinese sentiments amongst Kazakh policymakers were shaped profoundly by the belief that China had a neo-colonial attitude towards Central Asia. A 1954 map released by the Chinese government showing parts of Kazakhstan, Kyrgyzstan and Tajikistan as Chinese territory, provided convincing proof for the Kazakh elites’ concerns. Kazakhstan’s reduced ability to defend itself following its decision to renounce its nuclear weapons stocks further cemented elite feelings of distrust towards China. The ecological damage caused by China’s nuclear testing projects in the early 1990s and the Sinification fears associated with rising labor migration between China and Kazakhstan were also major obstacles to durable bilateral cooperation. The turning point in China’s security relationship with Kazakhstan came in 1996; in retrospect, that year was the starting point for fruitful defense cooperation. The Shanghai Five pact between China, Russia, Kazakhstan, Kyrgyzstan and Tajikistan (the precursor of the Shanghai Cooperation Organization, or SCO) legally bound all five countries to respect the integrity of the others’ borders. China was also the first UN Security Council member to sign a universal moratorium on nuclear tests, a move that thawed relations considerably with Kazakhstan. 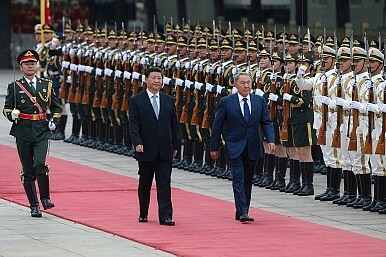 During the early 2000s, China’s military assistance to Kazakhstan shifted towards cooperation in the conflict against separatism and Islamic extremism. Senior leadership figures in the Chinese and Kazakh regimes arranged a consultation meeting in the wake of the 9/11 attacks that pledged unity in counter-terrorism measures. Chinese solidarity with Kazakhstan was demonstrated by donations of communications equipment and other technologies to the Kazakh military. Kazakhstan’s gradual pivot towards China is also linked to its broader desire to dilute Russia’s monopoly over the provision of its security. Northern Kazakhstan possesses a concentration of ethnic Russians and the 2014 Russian annexation of Crimea, which was partially justified by the need to protect Russian civilians, increased alarm among Kazakh policymakers about the possibility of a Russian military foray into this region. Kazakhstan’s prominence as an oil supplier for China due to pipeline constructions that commenced in the mid-2000s has increased its profile as a competitor to Russia, which signed a $400 billion energy deal with China to counter Western sanctions. To redress Kazakhstan’s concerns that deepened economic integration with Russia resulting from EEU membership will compromise its sovereignty, Kazakhstan has welcomed China’s military assistance so it can be prepared in the event of a Russian intervention on its soil. The principal focus of Kazakhstan’s October 2015 military deal with China is preparation for asymmetric warfare: a reference in the Central Asian context to combating terrorist networks and guerilla movements. China agreed to coordinate special forces training with Kazakhstan, to increase the Kazakh military’s preparedness for war in urban environments, mountain conditions and at sea. As Joshua Kucera recently noted in an article for EurasiaNet, this kind of training occurred previously under the auspices of the SCO but bilateral exercises are a new, intriguing development. Despite deepened on-the-ground military cooperation between China and Kazakhstan, the extent of bilateral coordination on security issues is limited. The operational language of the Kazakh military is still Russian and not Chinese. Kazakh military personnel are also largely untrained in Chinese military techniques. It is estimated that only 100 Kazakh students attended Chinese military academies in the past two decades. The Chinese PLA also possesses limited military reach in Central Asia, as Kazakhstan’s military continues to rely on imports of discounted equipment from Russian suppliers. China has also refused to match Russia’s offers with sales of decommissioned equipment from its own military. In light of these factors, it is clear that China’s dramatically expanded economic leverage over Kazakhstan relative to Russia has not translated equivalently to greater hegemony over Kazakh security policy. Border security is the most natural sphere for security cooperation between Kazakhstan and China, due to the perceived threat posed by the Uighur population who reside immediately southeast of Kazakhstan. But even on this issue, the bilateral relationship is marred by corruption and criminality. In 2011, Russian authorities discovered a $130 million smuggling ring on the Kazakhstan-China border, which allegedly earned more than $5 million a week on illegal car sales. The mysterious deaths of 15 border guards in the border post of Arkankergen in May 2012 alarmed Russian authorities and complicated Kazakhstan’s eventual accession to the Russian-led customs union. Russian officials have expressed concern that Kazakhstan could replace the Russian Far East, as the primary middleman in the trade of smuggled Chinese goods. Should this trade intensify as the EEU is mired in an economic malaise, China may be forced to scale back security cooperation initiatives with Kazakhstan, to ensure that its more vital energy interests and trade with Russia are not jeopardized. Kazakhstan’s announcement of expanded defense cooperation with China represents yet another confirmation of the shift in the bilateral relationship from adversaries to strategic partners. But China’s ability to meaningfully dictate Kazakhstan’s security agenda or lessen Kazakhstan’s dependency on Russia is more limited than these closer relations would imply. In the short term at least, Russian President Vladimir Putin has little reason to worry, as Chinese military influence will likely be projected more powerfully through the SCO (which Russia is also a member of) than through bilateral agreements that undercut Russia’s regional hegemony. Samuel Ramani is an MPhil student in Russian and East European Studies at St. Antony’s College, University of Oxford. He is also a journalist, whose work has also been featured in the Huffington Post, Washington Post, Kyiv Post and the Carnegie Endowment for International Peace.